News related to Protospiel San Jose and Bay Area game design. 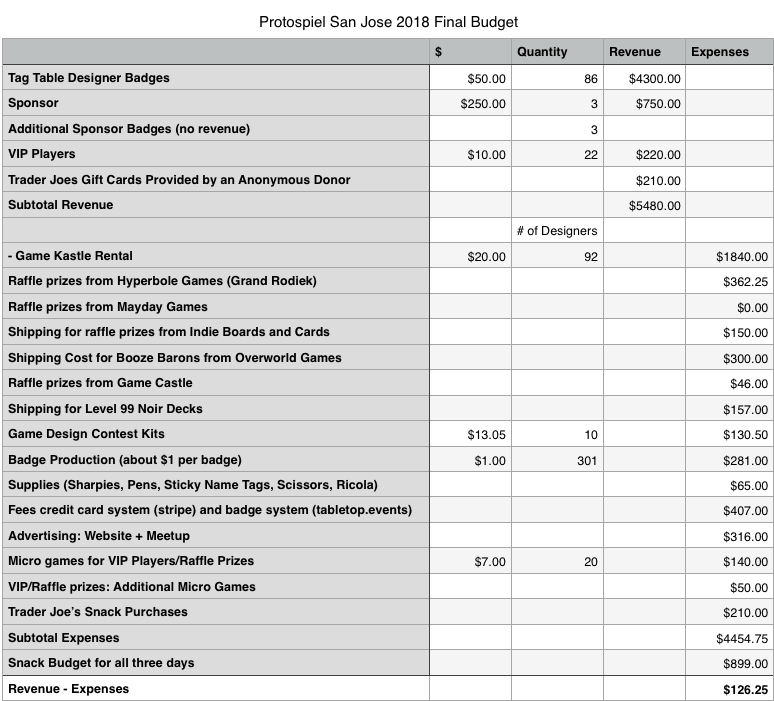 When is Protospiel San Jose 2019? I’m working too many hours at my day job to put together PSJ in time for spring. Instead, I plan to try and host the event in the fall of 2019. The target is October. I am sorry to disappoint folks who were looking forward to a spring event. Protospiel San Jose takes me about 100 hours of pre-show work to put together each year. In past years, I locked down the date 90-120 days in advance, booked the venue, and then started promoting the event. 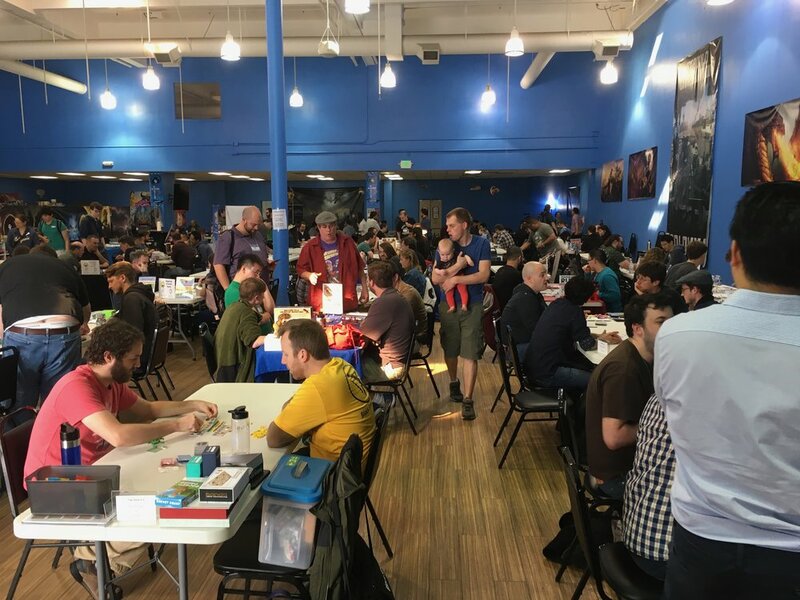 For ten to twelve weeks before the event I spend 5-10 hours a week answering questions, organizing volunteers, and getting the word out to as much of the tabletop community as possible. Protospiel San Jose runs on a tight budget and does not make money. Every year the budget with every dollar in and out has been posted publicly. The event has been successful because of the hard work by the volunteers who spend their own time and energy to support the show. As Protospiel San Jose gets bigger every year, it takes even more time and energy to pull off. More volunteers are needed to own new complexities, and more pre-show work needs to be done. In 2018 we had some new challenges arise that will require more planning and attention this year. For the first time last year we had issues with raffle prizes getting stolen in mass and with designers showing up and running tests without a badge or table space. I have been talking with some of the long time volunteers about how to mitigate theses issues, but we don’t have a solution yet. I’m in the middle of large assignment at my day job that will not finish until February or later. I simply don’t have 10 hours a week to pour into Protospiel right now. Also, I don’t want to run the event until we figure out ways to mitigate the theft issues from last time. A sincere thank you to everyone who loves the event and has reached out to me about it. I am grateful for your kind words. Thanks are also due to the people who did a lot more than show up to play games. Thank you to our past sponsors who put up the funding to make the event happen. Thank you to the people who took time off work to help set up, who took on projects (raffle, snacks, hotel block, designer diner, marketing, design contest) and the people who staff the front table with a smile. The volunteers are the real heroes of Protospiel. I hope to see you in the fall for another great community event. Time for the annual recap of Protospiel San Jose. This is provided to give you a peek behind the scenes, to act as a resource for other organizers, and to provide accountability. We had 750+ unique players and 80+ designers attend this year. We had an even greater number of Beginner Friendly Game Signs available at the front table this year so casual players could find games that fit their desired play time. At one point ALL of the signs were in use. Ricola at the front table. We went through a LOT of Ricloa this year. Two industrial size bags + more I bought at Walmart late Saturday. Good to see it was helping designers to maintain their voice. Secret Game Signs were once again available at the front table for games that needed to avoid photos and publicity. Only two designers out of 80+ needed them this year, and one of those designers was smart enough to print and bring his own. New signs for how the raffle works. At both the welcome/front table and the raffle table we had signs detailing how exactly the raffle worked. More on the raffle later. The designer diner was once again well attended. We will continue to offer this as long as there is a volunteer to organize it. Thanks to Shane for once again organizing this year. This remains a fun and uplifting side event. Each year a new designer organizes it and brings a fresh twist to the contest. Get a box of bits, design a game in an hour, then pitch it. Great practice for pitching. Several past design contest winners have gone on to be designer games in circulation. Thanks to JonnyPac for organizing the improv contest this year. We had an official hotel room block for the first time this year (the event is not in a hotel). Volunteer Rebecca did a fantastic job of setting it all up and we had lots of people take advantage of the deal. Many thanks to Rebecca and the Courtyard Marriott. Peter from Panda gave a well attended presentation about Panda GM and the services they provide on Friday. In every past year when we did panels, I got lots of complains about the panels. This year, only positive feedback about Peter’s presentation. Both March and April are crowded with events. This year we were date sandwiched between GDC and the Gamma Trade Show. There is no weekend that works for everyone. I need to hold the event earlier in the year in case we overwhelm the AC, so that we don’t roast the players. I’m considering running the event in early February next year (before DundraCon). Although you still get plenty of traffic in the back, some designers really hate being back there. I think I’m going to two sets of badges next year, with the second set being the back tables. Register early to get a better table. We ran out on Saturday and designers were asking for more. I will encourage designers to print their own sign next year and send out the template. We can’t provide signs for everyone, that would break the budget. This was bonehead move on my part. I forgot to turn this on in Tabletop.Events before printing, so the industry badges didn’t have company names on them. Will be fixed next time. We used a large industrial fan to keep the hall cooler. This required moving a designer table to the back. Many thanks to Jason Lentz and Philip Henderson for moving their table for the benefit of the entire community. Their team spirit and self sacrifice is greatly appreciated. A lot of the acrylics purchased five years ago to hold table signs were damaged this year. They have lasted almost five years, but were treated poorly this year. I will have to re-evaluate if its worth replacing them with a budget or if I’m going to let that perk go and put designers on notice for more of their own signage. We used the Tabletop.Events system this year to create a list of prototype games at the event. However, a lot of designers ignored it and I once again had publishers and players contact me after the event trying to find a particular designer they wanted to reach out to. Next time, I will push game entry harder. Game description entry only takes a moment, and it will get designers more remote play testers and publisher eyeballs. The raffle was more diverse this year with games from several sources. I plant to diversify even further next year. The raffle was a huge problem this year. We had games set aside in the back (and under a table) for the Sunday raffle. They were clearly marked. However, we still had problems with people blatantly stealing those games. People also took games from the store’s game library and helped themselves to armfuls of games multiple times. The level of theft was depressing. The era of the “honor system” raffle is sadly over. Next time we will have to have a much more controlled raffle, this will require additional volunteer labor, but I don’t see an alternative other than getting rid of the raffle all together. Please help spread the word for 2018! I have a favor to ask you. Please help spread the word for the event. The more players we can get, the better for everyone involved. We have a lot of raffle prizes as a thank you for the people who come to test games. Below are some printable flyers and cards. Take them to your local game night or post one up at work. Your friends and co-workers get to help out the local board game community and win games for doing so. Protospiel San Jose 2018 Registration is live. Player badges are free. If you plan to attend, please sign up for a badge. Get you on the mailing list to stay informed. Provide you with a nice printed badge and holder on site. Really help us out as we can plan snacks and raffle prizes based on registration. Please register for a badge and we will see you at the event! I have been asked several times to coach new designers on how to pitch at a Designer Publisher Speed Date. I’ve done a LOT of publisher speed date events, both as a designer and as an agent for a publisher. Below is some practical advice distilled from that experience. To prep for this article I interviewed several publishers to see what they wanted to get out of a speed date pitch. This advice has been developed with those publisher requests in mind. You would be surprised how often designers often forget this one. The number of players your game supports. How long it takes to play. This helps the publisher get a sense of the weight of your game. Be realistic. What audience you are aiming for (casual players, tactical gamers, bearded Euro players). What makes your game special or different from every other game on the market? There are tens of thousands of games out there and hundreds more come out every month. What makes your game stand out? What is unique compared to any other game? This is likely the MOST IMPORTANT thing you will say during your entire pitch. What are the win conditions? What triggers the end of your game? What does a typical turn look like? Don’t run through all the options and edge cases, give a concise example of a normal turn. Do NOT use all the time allotted explaining the rules of the game. If the publisher wants to know all the rules, they will ask you or ask for a copy of the rules. Do your homework on what publishers are looking for and what their existing lines are like. The list of publishers is posted ahead of speed date. Look them up and look at their games. Don’t go on and on about your 2 hour Euro game to a social games publisher. Be careful about comparing your game to other games. Some publishers find it helpful if you compare your mechanics to existing games so they can understand your game. “This game uses dice placement like in Kingsburg.” Other publishers do not like it when you compare your game to existing games. Referencing mechanics can help. “My game is better than game X” comparisons won’t help your pitch. Know the component counts in your game. Your list of components should also be on your sell sheet. If the publisher asks you “How many cards are in this game”, you need to know the answer. I. Listen and Answer questions. End your pitch early and offer to answer questions. Let the publisher drive the conversation to what interests them. II. Play a sample turn or round. Set up your game and advance it to the most exciting point of the game. Rig the hands, decks, and values to make for an exciting turn. Ask the publisher if they want to play a sample hand/round. If the game is not a good fit for the publisher you are talking to (this is often the case), ask “Who should I show this game to?” That will give you an idea of what publishers you should focus on or approach. Not all publishers are at speed date. Lastly, if you have other published games, mention that so the publisher knows you understand the process and how the industry works. Perhaps I’ll see you across the table some day at a publisher speed dating event. John Shulters of Black Straw Games pitching like a Pro at Designer Publisher Speed Date.